I put the kids on an airplane on Wednesday to fly down to Florida and visit their grandparents. Without us. We’ve never sent them away without us before. They’re 14 and 12 now, and they were super excited to go on an airplane alone (except for the giant badges they had to wear). As for my husband and I, we took the chance to go sailing. The Support Driven Expo I’ve been working on the past few months had just wrapped up in Portland, and the timing was perfect for us to get away for a couple of days. We found an in-law suite Airbnb — with a dock and a neighborhood boat ramp – in Deltaville, Virginia, about 5 hours away from our home in the Appalachians. On Thursday, we hitched up the boat and headed east. There’s not a lot in Deltaville, tourism-wise, but there is tremendous access to water. There were half a dozen marinas full of sailboats in this little town where there didn’t appear to be people, and there were canvas shops and sail tailors, and even the maker of our boat’s mainsail, Ullman Sails. We stopped in to get a new length of batten, and picked up some rope too since it was on sale. There was no wind when we arrived, so we pottered around town and got settled into our Airbnb before starting out in the late afternoon on the water. There was still no wind. We hoisted the sails and flopped around, then motored a bit to get closer to the mouth of the river where we saw some ripples that looked like they might be wind. We caught a couple of puffs and got a little bit of sailing in before we realized, hmm, in this sleepy little town, restaurants might close at 9pm. We were back at the dock and inside the house by 8:30, and yes, everything closed in 30 minutes and was also 15-30 minutes away. We wound up at a pizza place that at least had food that could go in our bellies. The atmosphere left a lot to be the desired, but we didn’t go hungry, so there’s that. Our second day, though — it was glorious! We had the entire day with nowhere we had to be except on the water. We motored out of the glassy creek at about 10 am after stocking up on lunch provisions (grapes, Babybel cheeses, corn tortillas, cherry tomatoes, hummus, and baby carrots, plus lots and lots of water). Once again we flopped around before motoring closer to the mouth of the river where we finally caught the wind. For hours we sailed. We tacked back and forth, on long tacks in steady wind. There was chop and lumpy water and we stayed dry and Egretta handled it beautifully. It’s amazing how different it is — how wonderful it is — to sail in a steady wind that doesn’t change direction or speed and that you could just spend all day on the same tack if there weren’t land in the way. The water slaps the hull when you’re sailing close hauled, which we were, since you’re sailing into the wind. When there’s chop, you’re cutting through it, and the sound is percussive. It smacks and claps as the boat bumps through the water. The wind is on your face, and it’s cool even when it’s 90 degrees. It feels like you’re going fast because of the wind flying by. I wanted badly to get out into the Chesapeake. We never did on our trip last year to Wareneck, when we were on Mobjack Bay. And on this trip it was right there, we could see it. So I told Brian I wanted to get out there, like dipping our toes in the Pacific if we were on the west coast. You can’t go that far and not dip your toe in. We couldn’t be that close to the Chesapeake and not wet the hull in it. So we kept sailing. Out and out towards the open water. We navigated crab pots, we ate on the water, we hove to and swam, we sailed with stingrays and a sea turtle and listened to the different sounds the water makes against the hull on different tacks. 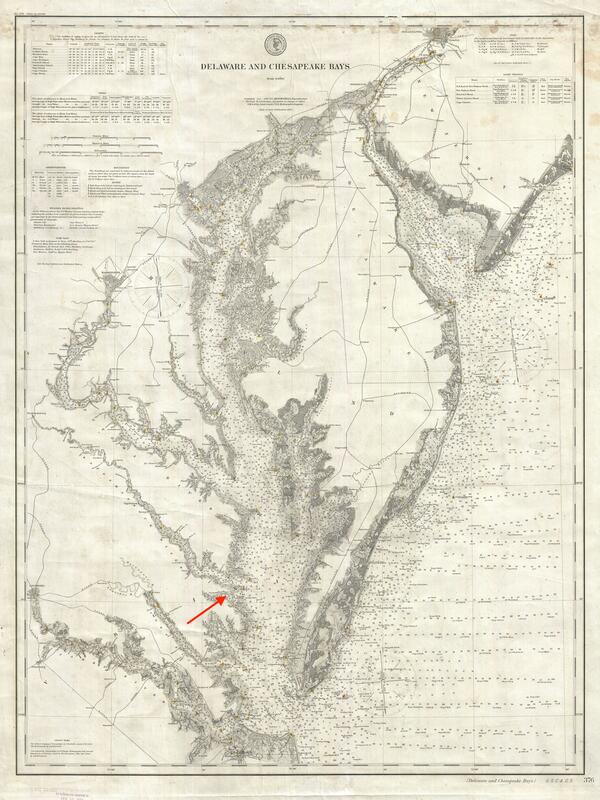 After a swim near the mouth of the river, we sailed out past both final points of land and were in the open water of the Chesapeake. There were swells and wind and the boat was beautiful and we sailed fast. It was wonderful! The swells were maybe 2-3 feet and we were totally fine in our little 17 foot day sailer. We kept sailing for another 30 minutes or so so that we were good and out in the Bay, then noticed our sunburned legs and also didn’t want to run into the same problem as last night with dinner. We decided we should be home by 5 pm at the very latest, and around 2 or 2:30 we turned around to come back in. With the wind at our backs, we flew. We surfed the swells. We ran so fast our bubbles streamed behind us. Instead of a slapping sound against the hull, the water gurgled around the rudder as we rushed through it. It swooshed and swirled, a gentle, flowing sound rather than a sharp smack. As we rode the swells, we sounded like waves on a beach, swashing as we coasted down a swell or one snuck up behind us. We stayed completely dry in the boat, and rather than a boring run back inshore, as we expected to experience on a hot day with the wind at our back (because you usually can’t feel it like when you’re pointed into the wind), it was thrilling. We were riding the water, riding the wind. We were with it, we were part of it. When I looked over the beam, the swells, which had turned to chop, were alongside us, running with us. It was beautiful. After washing up at home, we dressed for dinner and drove to Merroir, an outdoor oyster restaurant on the Rappahanock River. We ate ceviche and grilled oysters and drank a bottle of cold white wine that we kept in a metal bucket of ice on the table. We were back home and asleep by 8:30pm and slept all the way through until 8 the next morning. We had one more day of sailing but this post is already long, so I’ll stop with the words and just post the pictures and the 6 second video. The waters treated us to a double rainbow as we closed out our last Chesapeake trip. On this one, the waters treated us to dolphins swimming alongside our boat and playing in our bow and stern wakes. Impressed your sailing skills have improved to take on the Cheasapeke in a smaller boat. Boats don’t appeal to me, but your description might convince me to give it a try he next time I’m invited out. Thanks for sharing. I felt like I was in the boat with riding the waves. nothing can match the magic of a small boat. the world open up when those sails fill with wind. I have my own small boat I am trying to take around the world. Check out my blog.